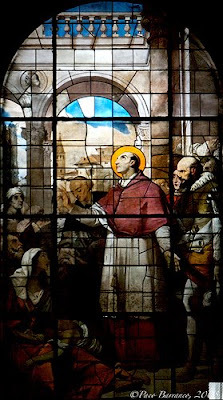 St. Charles Borromeo, one of my patron saints, was Archbishop of Milan, Cardinal-Priest of the Title of St. Prassede, Papal Secretary of State under Pius IV, and one of the chief factors in the Catholic Counter-Reformation -- was born in the Castle of Arona, a town on the southern shore of the Lago Maggiore in northern Italy, 2 October, 1538; died at Milan, 3 November, 1584. His emblem is the word humilitas crowned, which is a portion of the Borromeo shield. He is usually represented in art in his cardinal's robes, barefoot, carrying the cross as archbishop; a rope round his neck, one hand raised in blessing, thus recalling his work during the plague. His feast is kept on 4 November. St. Charles Borromeo - Ora pro nobis!